A while ago I decided that our master bathroom cabinet needed a change. I didn’t like the red wood cabinet look (It was here when be bought the house) so I decided to get out my paint brushes and go to town. I decided to try the Rust-oleum Chalked paint in Aged Grey for the project. It was my first time using this paint and I found it to have a good cover, I did need to do two coats as the wood grain was still coming through even with the cabinet being primed. There’s the before and after for the cabinet. I love how it turned out. I used a dark wax from Country Chic Paints, I’m not sure which colour it was but it was a dark one, maybe an espresso?? Let me know your thought on the project! I know it’s been a while but I’m back and let’s get this party started!!! A little while back I taught myself how to crochet. For those of you who know me this is a big deal since I’ve been trying to learn for ages. This past long weekend since it was in typical long weekend fashion here in Manitoba it gave us one nice day and two rainy days. 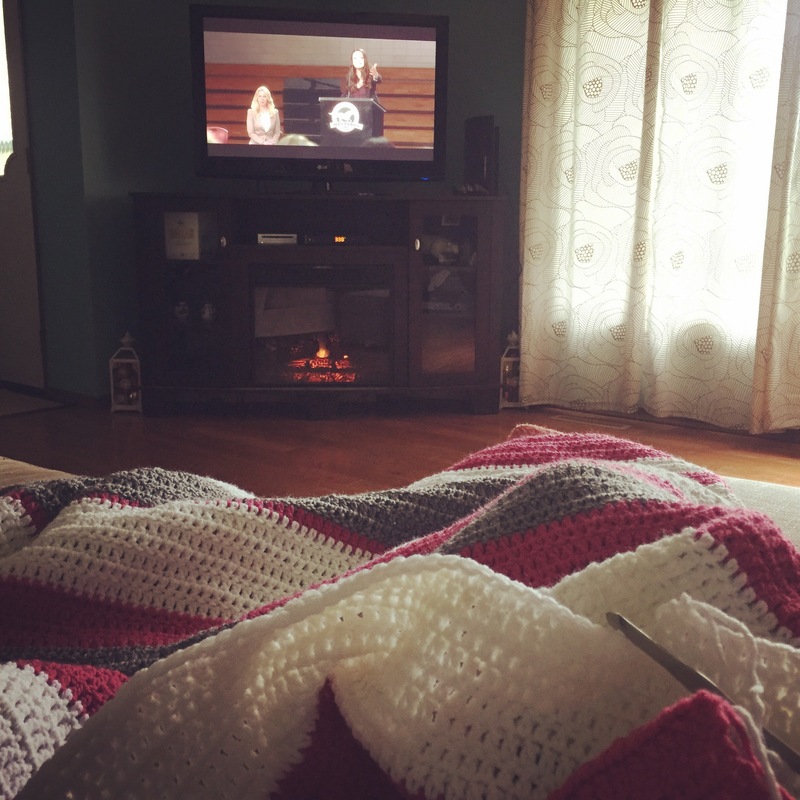 So I’ve been just trucking away at my first blanket, it’s double crochet for the whole thing, how much easier can it get for a first blanket. 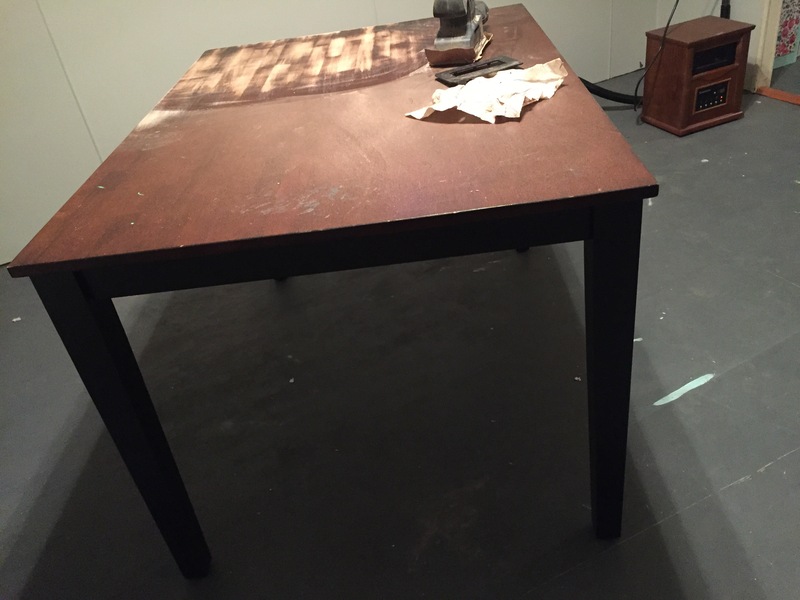 For a while now I have been wanting to refinish my table in my craft room. It was my old kitchen table from when I first moved out on my own and it was in some need of some loving. I forgot to table a complete before picture of the table so here’s the beginning work in progress, very dark and not the look I was going for in my craft space. 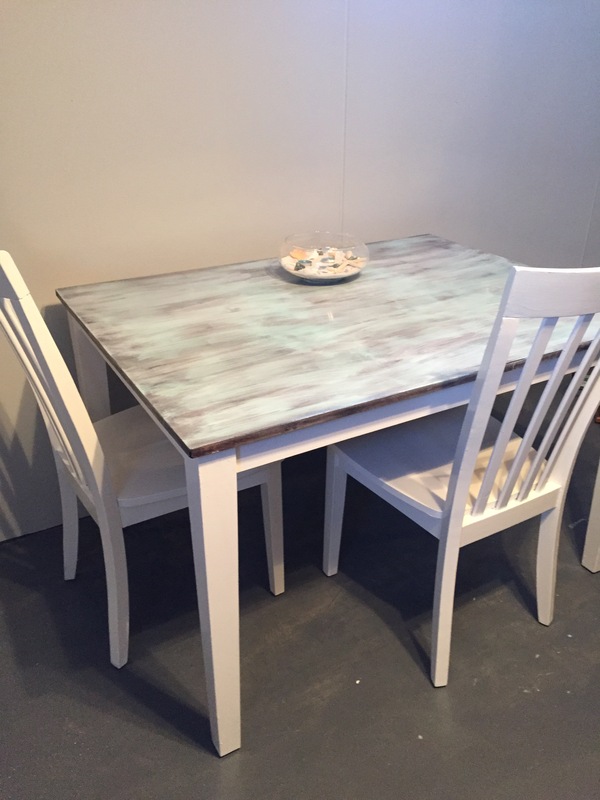 So one day when I was on Pinterest I had seen a photo of a white washed table with colour added to it and I said I could do that…..so that’s what I set out to do. I sanded down the top and legs so they were down to the bare wood. The top I then stained using Varathane Wood Stain in Espresso. While that was drying I primed the chairs that went with the set so they would become white as well as the legs of the table. Once the stain was dry I white washed the top with a 1:1 ratio using Amy Howard Chalk paint in Bauhaus Buff, this is also the paint that was used for the legs and chairs. I did two coats of white wash and another light coat of stain before doing the dry brush of the blue, which again I used the Amy Howard Chalk paint in Tick Tock (same colour from the file cabinets I had done earlier). Once the dry brush was completely dry I sanded down the table top in some parts so you could see more of the dark and white coming through. When I was finally happy with the colours that were showing I sealed the table using Varathane’s Diamond Wood Finish in Crystal Clear to seal everything up. There is about five coats of sealer on the table top and the chairs and table legs have three. So it is no surprise to the people that know me that not far from me at any one time is a blanket…I am cold all the time. 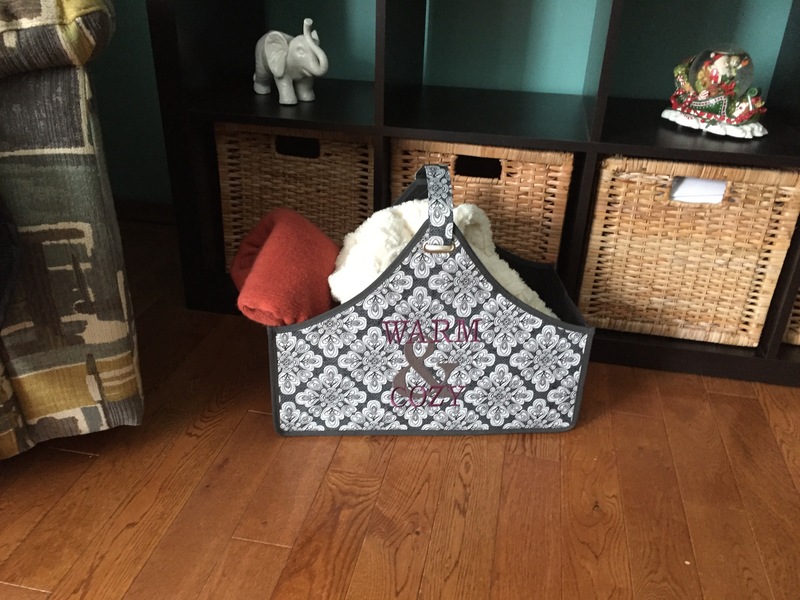 A couple months ago Thirty-One had a sale on the Catch-All Bin and I decided I needed one for the living room for the blankets. If you need one of these for yourself checkout the link to my Thirty-One Site for the current catalogue and sales. 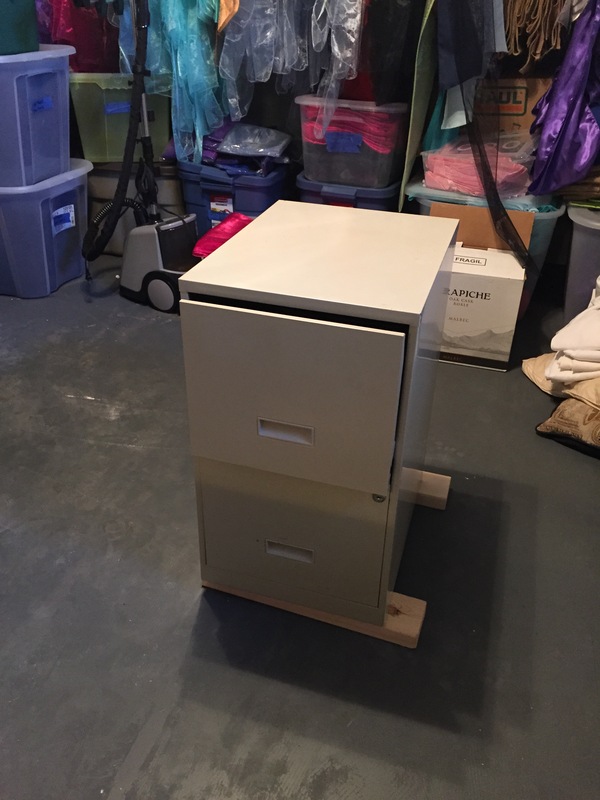 A while back I had come into possession of some file cabinets when my mom was packing up her house to move and no lover needed them. I though they would be perfect for holding all my Stampin Up! Stamps and cardstock. I had gotten two identical of these little beige beauties and thought since my craft space is more colourful I need to change these up. 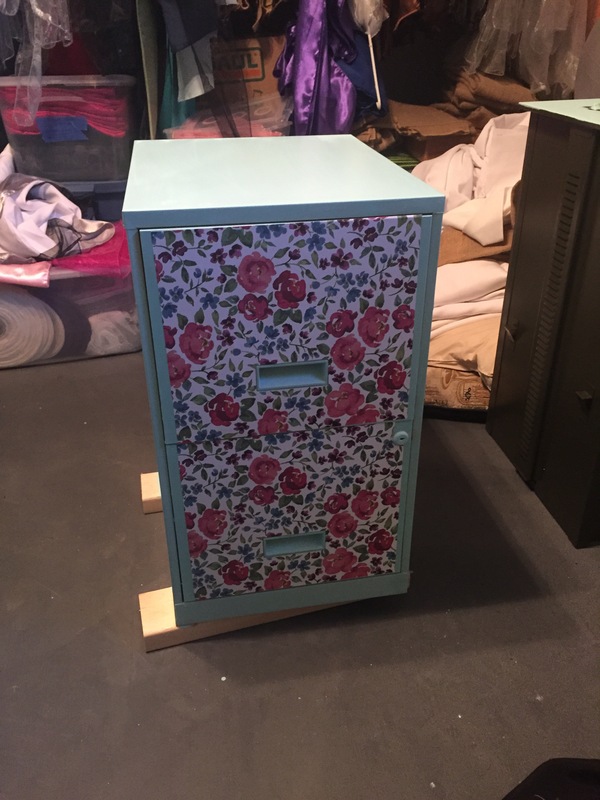 I used Amy Howard chalk paint in Tick Tock for the cabinet it self and the drawer front were done with some scrapbooking paper that I had in my paper stash that I always thought was too beautiful to cut up. I covered the paper with Mod Podge to keep it in place and then the whole cabinet was sealed using the Amy Howard Matte sealer for chalk paint. Much better than the boring beige. Hi everyone, I started this blog as an outlet for myself to show the creative side of me. On here you’ll find different projects that I am working on, different recipes that I’m trying out, reviews on different items, a little bit of everything. Enjoy!